The upcoming 3DS Zelda game, A Link Between Worlds, shares much of the same terrain with the classic Super Nintendo game The Legend of Zelda: A Link to the Past. But the game's lead creator tells Kotaku that there are key map changes in this sequel. The new 3DS game is set at least a generation ahead of 1991's A Link to the Past, Nintendo's Zelda franchise boss Eiji Aonuma told me this past week as we chatted about the game at E3. (We talked about the upcoming Wind Waker re-make, too.) "It’s not a direct sequel in the sense that it’s the same Link and Zelda. The world is the same and it might be a different generation of Link and Zelda." When the game was announced earlier this year, players of A Link to the Past noticed that the new game's overworld appeard to be the same as the SNES game's. They're similar, Aonuma said, but not identical. This isn't a remake. "It’s the same world," he said. "It’s the same space. But in the same way that, over time, the topography can change, there will be some changes. The land will be affected a little bit. "The dungeons, for the most part, will be in the same place, but inside might change. Now that I say that out loud, it sounds a little strange, but we’re making decisions based on what’s best for gameplay. We’re picking and choosing what we change and what we don’t, so players can expect some changes." Both the SNES and 3DS games are viewed from the same overhead perspective, which emphasizes the visual similarities. The new Zelda adds some elements that can make even exploring the familiar parts of its map a novelty. 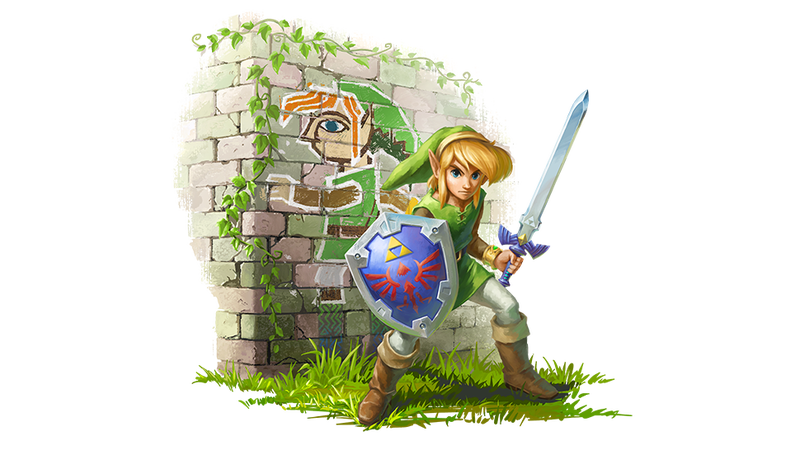 For one, the game's hero, Link, can flatten himself into a drawing and then run across flat, vertical surfaces. "We’ve added a dimension," Aonuma said, noting that it could take a familiar location and let "players see it in a whole new light." And within at least one of the dungeons we've seen in the game, Nintendo's designers have added a lot of verticality, encouraging players to make Link climb and jump his way up, appearing to nearly ascend his way out of the screen if the player is playing with the system's 3D effects on. It's not clear just what the new game's "Link Between Worlds" title refers to, and Aonuma didn't want to say. Asked if A Link to the Past's Dark World would be returning—that's the photo negative version of the SNES game's entire map that players could transfer Link to and from—Aonuma playfully shrugged. I think we can bet on a dark world of some sort. Not because of how Aonuma reacted but because, well, there is the game's official logo. The new Zelda will be out for the 3DS in November.